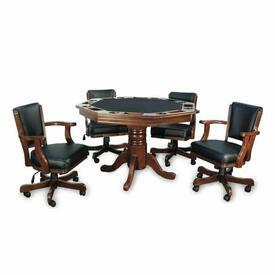 Presidential Billiards Poker Tables are for sale at Family Leisure, and we offer free shipping! Family Leisure provides all of the game room furniture, accessories and anything else you need for home recreation. We promise to offer shoppers the lowest prices, and we bring all products to your doorstep with our famous free shipping. These products are old fashioned, with ornate detailing, durable hardwood and the classiest components throughout. 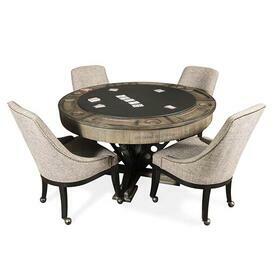 If you are looking for the perfect poker table for your classy man cave, or an accent piece for your bar room or game room, take a look at what we have to offer. Presidential was made famous for their gorgeous heirloom billiards tables, and now they are taking the world of poker by storm. Find round, octagonal, Texas Hold 'Em and two-in-one models.